An ancient elephant migration route in southern Africa is to be cleared of mines to create new living space for swelling herds. The 150km strip will allow passage to 120,000 elephants crowded in Botswana into Angola and Zambia. The $1m UN-backed initiative was unveiled at an anti-landmine summit in the Kenyan capital Nairobi on Thursday. Angola is one of the world's most heavily-mined countries after nearly 30 years of civil war. There are 2,200 known sites harbouring mines or unexploded ammunition, according to United Nations Environment Programme (Unep). Environmentalists said the elephants appear to sense the danger of the mines, and have confined themselves to an area of 107,000 sq km (41,320 sq miles) in northern Botswana, which is being laid to waste by their surging numbers. The elephants are also coming into increasing conflict with villagers because of the damage they are causing to crops and the daily threats to human life. "An estimated 120,000 elephants, whose numbers are growing at 5% annually, would be able to move north into Angola and Zambia if the mines were cleared," said Unep. The project is part of a wider plan to create a vast cross-border conservation reserve, stretching from Zimbabwe through Botswana, Namibia, Angola and Zambia. The mine-clearing, spearheaded by humanitarian organisation Roots of Peace, will initially focus on a 150 sq km (58 sq mile) area of the Luiana Partial Reserve in south-eastern Angola. The initiative could be a boon Angola's fledgling eco-tourist industry as the impoverished country attempts to rebuild itself after decades of conflict. 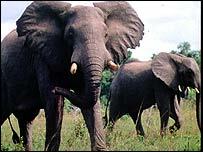 Dr John Hanks of Conservation International, which developed the project, said de-mining would give Botswana's elephants "access to Zambia and back into Angola, enabling them to follow ancient elephant migration routes presently barred by the presence of the land mines". He added: "If this option is not followed, Botswana is faced with the stark reality of shooting and killing up to 60,000 elephants (to control the population) over the next few years."